Post and wire systems are a cost effective, versatile and completely humane bird deterrent. Post and wire provides an ideal solution for ornate building facades where the anti perch system's visual impact is an important factor to be taken into consideration. 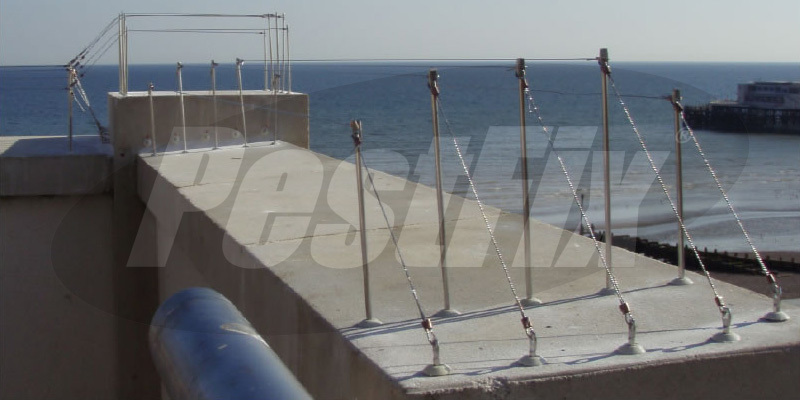 Each system works by positioning thin steel wires, tensioned with springs, just above a ledge or other feature that is used by birds as a roost. The wires present a physical barrier and the unstable feel of the spring-loaded wires will deter all but the most persistent birds. The wires are held in position by vertical stainless steel posts which can be inserted into 25mm masonry rivets or surface mounted in plastic bases. Post and wire can also be attached to rails, gutters and steel beams using specially designed posts which can be clamped to the desired object. Each run of wire should be tensioned at each end by a short wire attached to a stainless steel screw pin and plug. Each run of post and wire should be anchored at each end to spread the load of the tensioned wires. For masonry this is done with a screw pin and wall plug. For plastic, metal and glass use a surface mount base. Leaving a gap of 115mm for pigeon posts and 150mm for seagull posts install the first post. For masonry use a 25mm rivet and for plastic, metal and glass use a surface mount base to hold the post. Next run a short length of wire from the anchor point to the eye in the top of the first post, securing the wire at each end with a crimp. 0.45mm pigeon wire is secured using nickel crimps. 0.96mm seagull wire is secured using 1.0mm copper crimps. Leaving a gap of up to 1.5 metres for pigeon wire and up to 3 metres for seagull wire install your next post. Attach a spring to the eye at the top of the newly installed post. Measure and cut a length of wire approximately 10 centimetres longer than the space between the first and second posts. Secure one end of the wire to the eye in the top of the first post. Then loop the other end of the wire through the spring on the second post. Apply a small amount of tension to the wire so that the spring is slightly stretched and crimp the wire to the spring. Repeat this process until you reach the end of the ledge to be protected. At the end of the run install a second anchor point similar to the one at the beginning of the run. For wider ledges multiple rows of post and wire may be required. For proofing against pigeons leave a maximum space of 60mm between the rows of wire. For seagulls leave a maximum space of 100mm between rows. For extra protection you may want to alternate the height of the posts for each subsequent row of wire.